Listening Ears near Greatstone-on-Sea, Kent, Great Britain. 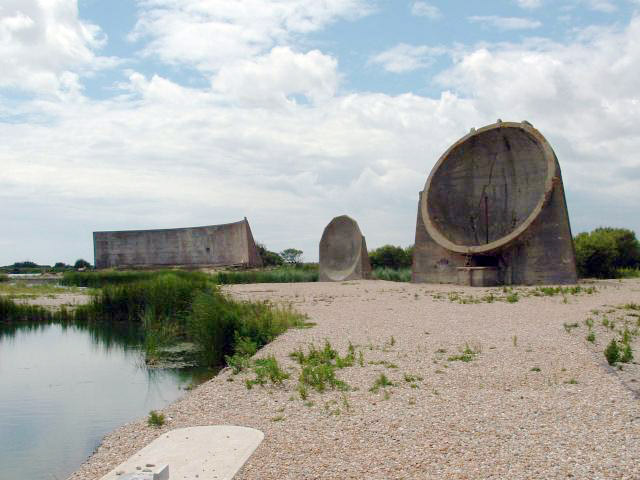 These are concrete listening ears built for the war. by observers positioned near these “ears”. All visitors should be aware that they have no reasonable expectation of privacy in public or private locations. The U.S. Mission regularly receives reports of human and technical monitoring of U.S. private businessmen and visiting U.S. citizens. The areas around U.S. and other foreign diplomatic facilities and residences are under overt physical and video surveillance – dozens of security personnel are posted outside of facilities and around residences, while video cameras are visible throughout diplomatic quarters (offices and residential neighborhoods) of Beijing. Thousands of additional video cameras were added throughout Beijing in advance of the Olympics to aid law enforcement authorities. All hotel rooms and offices are considered to be subject to on-site or remote technical monitoring at all times. Hotel rooms, residences and offices may be accessed at any time without the occupant’s consent or knowledge. Elevators and public areas of housing compounds are also under continuous surveillance. In one instance, the management company of a residential compound informed its tenants (to include official Americans) that their apartments were subject to search. Embassy employees are warned not to discuss classified or sensitive information in their homes, vehicles or offices. Post strongly encourages members of the private sector to take similar precautions to safeguard sensitive, personal and/or proprietary information. All means of communication – telephones, cellular telephones, faxes, e-mail, text messages, etc., – are likely monitored. The government has access to the infrastructure operated by the limited number of Internet service providers and wireless providers operating in China. Wireless access to the Internet in major metropolitan areas is becoming more and more common. As such, the Chinese can more easily access official and personal computers. The Chinese Government has publicly declared that they regularly monitor private e-mail and Internet browsing though cooperation with local Internet service providers. The government also employs several thousand individuals to police the Internet. Bloggers are subject to particular scrutiny in China where such activity is usually not permitted and blog sites are, as a general rule, blocked. Sounds so — totally crappy, right? I wonder if anyone make up stories just to keep the listeners occupied. If you read all 864 pages of Anna Karenina aloud, what might the big ears do with that? Record it… translate it … pursue dead ender trails ?? ?